The island of Egmont Key was quite significant in earlier times. Hernando De Soto and other Spanish conquistadors passed by here in the early 1500s, and it was a prison camp for Indians during the Third Seminole War in 1856-1858. Over three hundred Indians, including the famous Billy Bowlegs, were kept here while waiting to be transferred to the West. During the Civil War, the island served as a base for Confederate blockade-runners who traded with Caribbean merchants, selling cotton and tobacco and buying coffee, tea, and much-needed war supplies. That was short-lived, however, because the Union Navy captured the island and used the lighthouse as a lookout for enemy ships. Confederate prisoners were kept on the island, along with nearly two hundred escaped slaves. Yellow fever visited Egmont Key in 1887, and a hospital was established. Ten years after the epidemic, it was time for the Spanish-American War, and a large fort was built on the island. Over one thousand tents housed soldiers and wounded troops returning from Cuba, but the invasion never came to the area as anticipated, and the fort’s soldiers never saw any action. When the year 1916 rolled around, the island’s military population grew to about six hundred people, and there were about seventy buildings, including a school and movie theater as well as tennis courts, brick roads, electricity, telephones, and even a small railroad that ran the length of the narrow, mile-and-a-half-long island. Today the massive concrete fort has been undermined by the gulf and makes an eerie spectacle against the clear ocean waves. Little remains that is recognizable on the island except the fort, some brick roads half buried in the sand, and of course the lighthouse. A few small wooden cottages exist on the island that are used to house members of the Tampa Bay Pilots Association. These men board large freighters and guide them under Tampa Bay’s Sunshine Skyway Bridge into the port of Tampa. Two lighthouses have been built at Egmont Key. 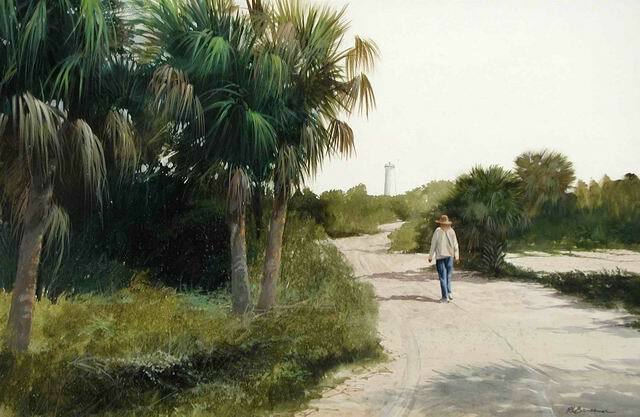 The first lighthouse at Egmont Key was built in 1848, then destroyed by a hurricane. Ten years later, another was built and still stands today. The Egmont Key lighthouse is not open to the public, but you can walk throughout most of the island and enjoy the beaches except for certain nesting areas. The Coast Guard, whose job it is to maintain lighthouses, began automating all of them in the 1960s: Egmont Key’s light was automated in 1989. The island is a national wildlife refuge and state park. It’s a wonderful place to a have a picnic or to explore, with its brilliant white sandy beaches, unspoiled by tourists. In fact, if you go there, you may find you have the entire island to yourself except for a few pilots and the park ranger, who also serves as lighthouse keeper. The currents from Tampa Bay in this area can be ferocious if you’re in a small boat, so be watchful. Unless you have a boat, nearby Fort DeSoto is the closest place from which you can see the lighthouse. There you can also visit the fort and enjoy the beaches or fish at the pier.